Summary of the April 14-16 US tornado outbreak | Watts Up With That? 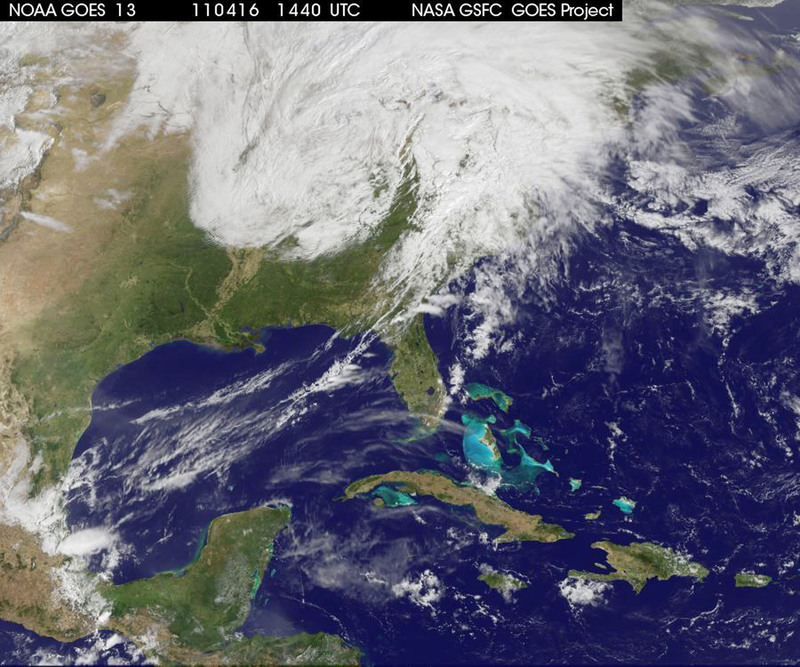 The GOES-13 satellite captured images of the powerful weather system that triggered severe weather in the southern U.S. this weekend, and NASA created an animation to show its progression. GOES-13 satellite data showed the strong cold front as it moved eastward from Saturday through Monday and generated tornadoes before moving off-shore into the Atlantic Ocean. NASA’s Aqua satellite also captured data from the system and took the temperature of the cold front’s cloud tops and revealing severely cold temperatures of some of the thunderstorms. The Geostationary Operational Environmental Satellite called GOES-13 monitors weather in the eastern half of the U.S. and is operated by NOAA. The NASA GOES Project at NASA’s Goddard Space Flight Center in Greenbelt, Md. 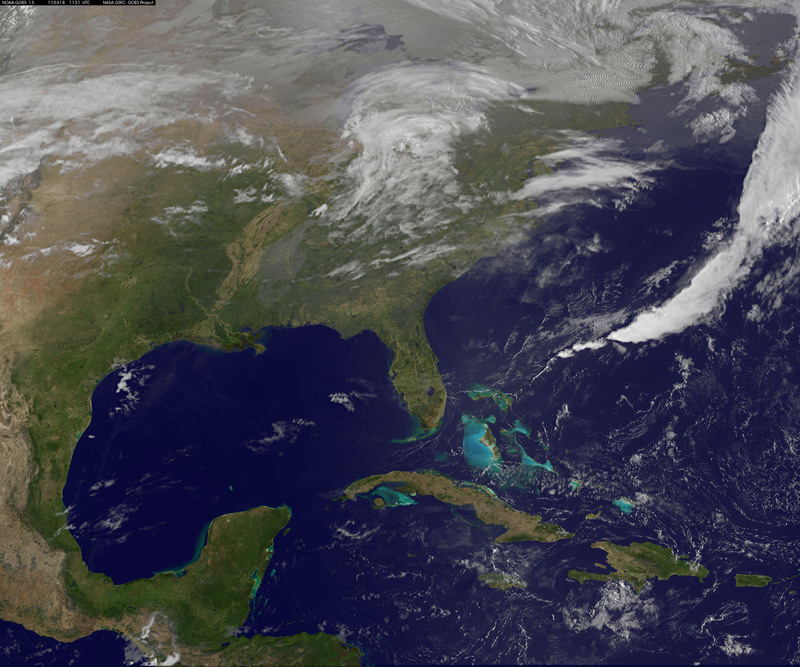 creates images and animations from the GOES satellite data. 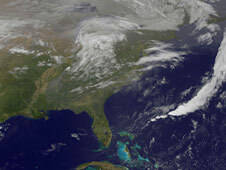 The NASA GOES Project created an animation of the satellite imagery from April 15 through April 17 that showed the movement of the powerful cold front through the eastern U.S. In the movie, you can see the low pressure area over Oklahoma on April 15, in a tight circular rotation and watch it move east bringing the cold front with it. NOAA’s Storm Prediction Center noted that the system generated 243 tornadoes in 13 states in three days, from April 14-16. According to the Weather Channel, the weather system generated 29 tornadoes on April 14 across the states of Oklahoma, Kansas, Arkansas and Texas. As the storm moved east, 73 tornadoes touched down in Alabama, Mississippi, Illinois, Arkansas, Kentucky, Missouri and Louisiana on April 15. On Saturday, April 16, 51 tornadoes were reported in North Carolina, Virginia, South Carolina, Alabama, Georgia and Maryland. Alabama, Mississippi, North Carolina and Virginia have all declared a state of emergency. This infrared image from the AIRS instrument aboard NASA’s Aqua satellite on Apr. 16 at 18:29 UTC (2:29 p.m. EDT) shows the cold high cloud tops of the strong thunderstorms (purple) that spawned tornadoes in North Carolina and Virginia on April 16. The purple areas indicate cloud top temperatures as cold as or colder than -63 F/-52C. Credit: NASA JPL, Ed Olsen NASA’s Aqua satellite captured an infrared image from its Atmospheric Infrared Sounder (AIRS) instrument on Apr. 16 at 18:29 UTC (2:29 p.m. EDT). 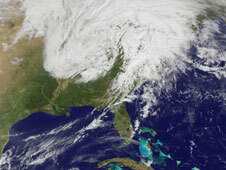 The image showed very cold, high cloud tops of the strong thunderstorms that spawned tornadoes in North Carolina and Virginia. The coldest cloud tops indicated the strongest storms. Temperatures in those clouds were as cold as or colder than -63 F/-52C. Then, visit Ryan’s FSU Weather Map page for animations of the entire tornado outbreak, as the storms traveled from Oklahoma eastward, from the 14th onwards. The Java animations have hundreds of images, again with the TOR warnings superposed. 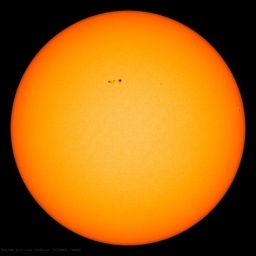 ← Another inconvenient web posting "disappeared"
To this day I really don’t get how they can ‘predict’ heightened storm intensity or extreme weather based on a fraction of a degree warming. It must be modelled. And they must do a mighty job of ignoring real data like the intensity/frequency graph leading this article. I am not trying to start a OMG the numbers are getting bigger response, just saying that they are. Anthony, any chance you know how to also get a U.S. map with precitation that fell during only these three days? Seems that would be key whether this system was merely warming driven or by the mass condensation removed from the atmosphere with volume collapse. Maybe Dr. Makarieva might also have a comment along these lines. That would be a great storm to study if enough simultaneous data of all parameters could be located. Very interesting because all I have heard from MSM is how storms “are getting worse than before”. Which leads to questions: Who are the ones (request from many of our users) and why the change? What benefit does the chance bring? Very interesting because all I have heard from MSM is how storms “are getting worse than before”. Which leads to questions: Who are the ones (request from many of our users) and why the change? What benefit does the change bring? Meanwhile in UK the alarmist press are getting ready to trumpet a record mild April as evidence of global warming. Never mind that December was record cold and also proof of global warming, or that the globe is actually cooling. Pretend the Earth’s average temperature were to rise a fraction of a degree. The effect of that temperature increase during the middle of Spring would mean that the air would be fractionally warmer perhaps a few days earlier in the season. The few days difference would have ZERO effect on any storm’s intensity. I think global warming causing increased storm intensity is just not logical. I would assume that the insurance carriers and the insured that suffered storm damage would want to keep all reports to base the claim and rotation of losses further up the feed chain in the Ins business. Think about all of the tracking of claim problems in the past when reports were disappeared from the records when deemed a duplicate. Must have been an insurance claim to underwriter paper trail nightmare!! The sharp delineation of those line is amazing. It looked like a bullwhip snapping through. The conditions must have been perfect for that to happen. Mom’s house up in Illinois had a storm line come through, stop in Iowa, then back up and loop through again. Our news media here in eastern NC have reported tornados causing significant damage in eastern NC counties of Onslow, Bertie (Behr TEE) and others. Preliminary counts range from 70 – 90. At least 22 dead and 130 injured, 800 homes destroyed or with extensive damage. We got nailed…badly. Anthony (see above) has already linked to my analysis of the excellent forecasts and warnings. Is it my imagination or would a trend line show an overall downward trend since the 70’s? And if memory serves correct, wasn’t February of ’10 or ’09 the first month in US recorded history when a tornado didn’t touch down? It could be suggested that we’re experiencing a low in the number of strong to violent tornado’s. I guess the point I want make is, it is hard for the numbers in the chart to go anywhere but up. Bob in NC- I have family in Wilkes County. so does my wife. Now I have to go scrape my windshield-again…. I live right between the paths taken by two of these – one that hit Raleigh and the other that hit Smithfield. Pretty much the same distance on either side. It’s unreal that I was AT one of the places demolished by the Raleigh tornado just a couple hours earlier that day. My daughter lives in Selma. One of them went right through there. It was rather nerve-wracking. One important fact about the tornadoes is that there would be no massive outbreak without the massive amount of cold air over the Dakotas. I live in SD and can tell you that the temperatures have been running 15 to 20 degrees below normal, maybe at times 25 degrees below. We’re getting snow almost every day without any relief in sight. Without the clash between cold and warm air, there would be few storms. 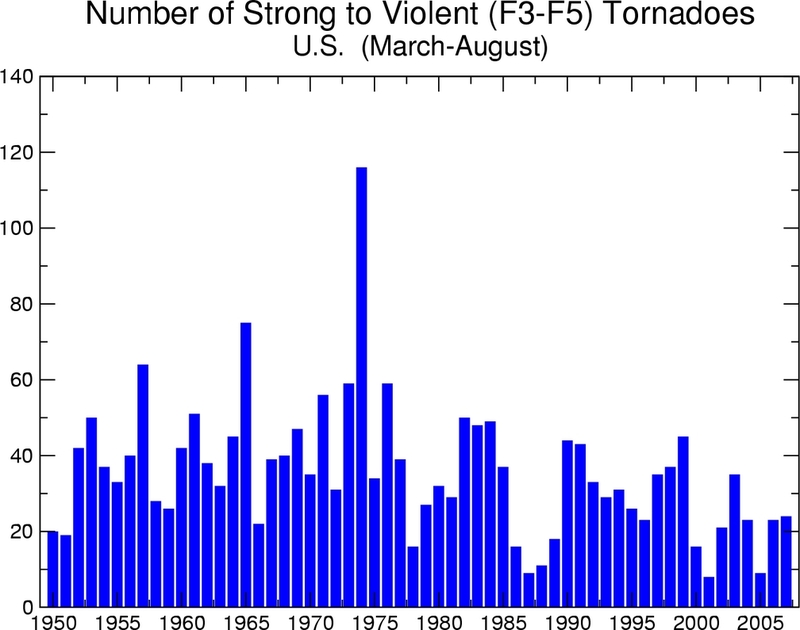 …It could be suggested that we’re experiencing a low in the number of strong to violent tornado’s. Tornado’s what? Oh, you meant tornadoes, not “belonging to a tornado”. I disagree. The claimed warming must occur by being evenly distributed. Your temperature differentials are just weather. The AGW is a theory based on our human made CO2 causing this “warming”. The manufactured CO2 is quickly, relatively evenly, disbursed worldwide throughout the lower altitude air masses. Therefore this “warming” has to occur everywhere at the same time, when one is counting using a 24 hour rotation period of the earth. Imagine microwaving the entire Earth all at once and raising the temperature instantly by 1 degree F everywhere. The temperature differential between different locations would not change at all. Some ice would melt at marginally frozen areas, but any storm that was in progress would maintain the exact same intensity, just happening at one degree higher on the thermometer. This theory of a warming Earth making storms more powerful is crap-sci. I agree that it’s crap. But, since climate is the aggregation of weather over time, if not every point where we have thermometers has warmed, then it would seem there is no global warming.